Friday evening of Homecoming Weekend, the Governor's Ballroom in the Capitol Plaza Hotel was again filled to capacity for the 1819 Circle Reception and Dinner. General Gordon R. Sullivan '59, former chairman of the Board of Trustees, and former Partridge Society President Mark D. Thompson '79 addressed the crowd of 1819 Circle members, the Class of 1957, and members of the Old Guard. This dinner recognizes those dedicated individuals who have made provisions for Norwich in their estate plan through a will, trust, or other deferred gift vehicle, thus earning the privilege of becoming members of the 1819 Circle. During this dinner the members of the Class of 1957 were welcomed into the distinguished ranks of the Old Guard, as student leaders presented them with their Old Guard medallions. 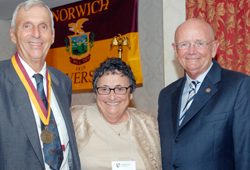 Among those recognized during the evening's festivities were Bob and Charlotte Lavette '57, who included Norwich in their will in honor of his 50th reunion. "If it wasn't for Norwich giving Bob a second chance, we would never have made it and we never forgot that," said Charlotte regarding their generous bequest to Norwich. Bob and Charlotte Lavette met when they were 17 and 15, respectively, through their fellowship group at church in their hometown of Lawrence, Massachusetts. They were engaged for three years before getting married in February of 1957. He started at Norwich in 1953 but was not quite prepared for the academic rigors of college and left Norwich after a year and a half to work with the State of Vermont as a surveyor. When he realized that his surveyor's salary could never support his new family, he went back to Norwich and asked GEN Harmon for a second chance. That second chance is what the Lavettes credit their success in life to. After a short while living in the pre-fabs, a new rule mandated that wives were required to live 10 miles from campus, so Charlotte moved to East Montpelier, where she worked for a granite shed in Montpelier and then for the Unemployment Compensation Office. After graduating in 1960 with a degree in civil engineering, Mr. Lavette worked on the Minuteman Program in North and South Dakota, building silos to help with the Cold War effort. In 1964, they moved to Florida where he worked on the Saturn Program at Cape Kennedy. After seven years the family, with four children in tow, moved to Tallahassee where he began a job with the Department of Transportation. He served as the Director of Operations, with 900 employees in 15 counties across central Florida under him, and retired in 1997 after 25 years of service. Having started out with such meager means and four children to support, both Bob and Charlotte Lavette understood the value of saving. Mr. Lavette learned about the stock market and made careful strategic investments with their savings. Combined with his long tenure with the State of Florida and the generous retirement plan the state offered, they realized they had accumulated enough to live comfortably and still give back to those they felt had made their success possible. The timing of their gift could not have been more fortuitous, as it counted not only towards the Class of 1957's 50th reunion gift, but also the Mapes Matching Opportunity (which doubled their gift to Norwich), and the Norwich Forever! campaign! They feel their success was truly defined when their oldest grandchild, Christopher Lavette '06, graduated from Norwich in 2006. Chris is now enrolled in Navy Flight School in Pensacola. Bob and Charlotte Lavette were pinned by General Sullivan '59 as members of the 1819 Circle on Friday night, and as Lifetime Members of the Partridge Society by President Schneider at Saturday's Partridge Society Luncheon in Kreitzberg Arena. The recognition of their generous support was only a small part of what was so meaningful for them about Homecoming Weekend, "Homecoming was one of the most wonderful weekends we have ever had, we just had no idea that it would be like that. Mr. Lavette felt like he was treated as such a special person." Though they certainly saw a great many changes on campus from their days in the pre-fabs, both could tell that the core values at Norwich are the same as they have always been and that is something they are proud to support. "We always had good feelings about Norwich; [during Homecoming] we saw these kids and got to see what they are really like--the character, the integrity--that is what Mr. Lavette saw when he was at Norwich and it is the same now." Bob and Charlotte Lavette can rest assured that their support--both their current gifts and their bequest--will help ensure that the Norwich they knew in the '50s and the one they revisited at their 50th reunion, will be the same Norwich, forever.